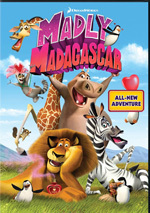 Eager to expand their animated home video domain over all the holidays, DreamWorks aims for Valentine’s Day with 2013’s Madly Madagascar. King Julien (voiced by Danny Jacobs) feels unloved so he rejoices when an allegedly irresistible perfume falls from a passing plane and lands on his head. He takes this to mean he’s destined to become the “king of love” and markets his own version. In the meantime, the rest of the guys plan to celebrate Valentine’s Day. Alex (Ben Stiller) remembers it fondly from his time in New York, so he encourages others to get into the mood. Melman (David Schwimmer) wants to “go big” for his first Valentine’s Day with Gloria (Jada Pinkett-Smith), while Marty (Chris Rock) falls for an okapi (Taraji P. Henson). Different animated films lend themselves more naturally to some holidays over others. Beauty and the Beast would make sense, but Madagascar? Not so much. Strangely, when I think romance, I don’t conjure visions of wild animals stuck in the middle of Africa. Accepting the oddness of love among jungle critters, Madly offers moderate entertainment. To put it mildly, it comes with a thin plot – or a collection of thin plots, I should say, as it combines a mix of narratives into its brief running time. None of these excel, but none of them flop, either, so they give us reasonable amusement. And the show knows better than to overstay its welcome. That’s one advantage of the Madagascar efforts: they move quickly and spread the wealth among their characters, so even if you tire of one thread, you'll get another one before long, and you might like it better. DreamWorks projects manage to bring back most of the main actors, and that continues with Madly. Of the folks from the original flick, only Sacha Baron Cohen stays away from his role as Julien. As he’s done in the past, Jacobs provides a capable substitute, and at least Henson brings us a little added star power with the new okapi role. 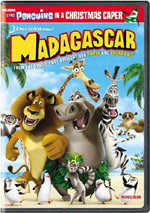 Ultimately, Madly Madagascar offers competent Valentine’s Day entertainment. It’s not the best of the DreamWorks holiday specials, but it provides a breezy, likable enough affair. Merry Madagascar appears in an aspect ratio of approximately 1.78:1; the image has been enhanced for 16X9 televisions. This was a terrific presentation. Sharpness looked strong. The only softness was due to the limitations of SD-DVD, but even those instances were minor. Overall definition seemed accurate and tight. I also noticed no jagged edges, shimmering, or edge enhancement. Source flaws were absent, as expected. With its jungle settings and other natural landscapes, Madly boasted a wide palette of colors. From start to finish, the DVD replicated them with nice vivacity and liveliness. Blacks were tight and dense, while shadows looked smooth and clean. This was an excellent transfer. I wasn’t as impressed by the Dolby Digital 5.1 soundtrack of Madly Madagascar, but it suited the material. Much of the soundscape concentrated on general ambience, though some scenes kicked into higher gear, as a few action-oriented bits came to life. These weren’t frequent elements, though, so expect a track that stayed moderately subdued much of the time. Nonetheless, it was fine for a romance-oriented comedy. Audio quality seemed solid. Music was full and rich, while effects came across as accurate and distinctive. Speech was also concise and natural, without edginess or other issues. This was a more than acceptable “B” soundtrack. In terms of extras, we get two bonus shorts. First Flight runs eight minutes, two seconds and shows a middle-aged guy who bonds with a baby bird while he waits for a bus. The dialogue-free piece seems more like something Pixar would make, and it’s not especially successful; it gets the “cute” part down but lacks the emotion it needs. Hammy’s Boomerang Adventure lasts four minutes, 58 seconds and gives us Hammy the squirrel from Over the Hedge as he plays with a boomerang. With an emphasis on physical comedy, it feels more like a DreamWorks short than “Flight”, and it’s more entertaining. Oh, and I was pleased to see that original actors Bruce Willis, Steve Carell, Wanda Sykes and Garry Shandling show up here, though that makes sense when you realize that “Boomerang” was created in 2006, the same year the feature film hit screens – indeed, it showed up on that movie’s original DVD. The disc opens with ads for Rise of the Guardians and Dragons; Riders of Berk. If you can get past the weirdness of the “romance among the jungle animals” concept, Madly Madagascar delivers decent amusement. Nothing here excels, but we get a breezy, enjoyable comedic piece. The DVD offers excellent visuals and good audio along with two new shorts. Madagsascar fans will enjoy this minor offering.